Stuttgart. The 918 Spyder embodies the essence of the Porsche idea: it combines pedigree motor racing technology with excellent everyday utility, and maximum performance with minimum consumption. The task faced by the development team was to create the super sports car for the next decade with a highly efficient and powerful hybrid drive. Developing the car from scratch, appropriately beginning with a sheet of white paper, allowed the team to come up with a no-compromise concept. The entire car was designed around the hybrid drive. The 918 Spyder therefore demonstrates the potential of the hybrid drive to a degree never seen before: the parallel improvement of both efficiency and performance without one being at the cost of the other. 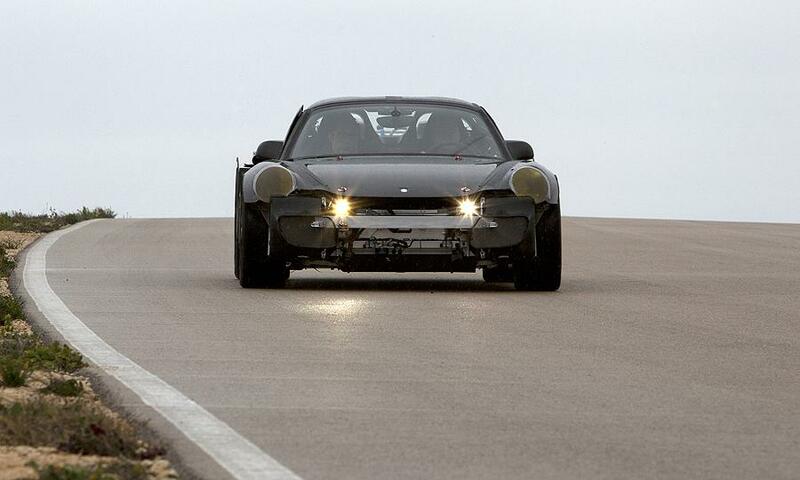 This is the idea that has made the Porsche 911 the most successful sports car in the world for 50 years. 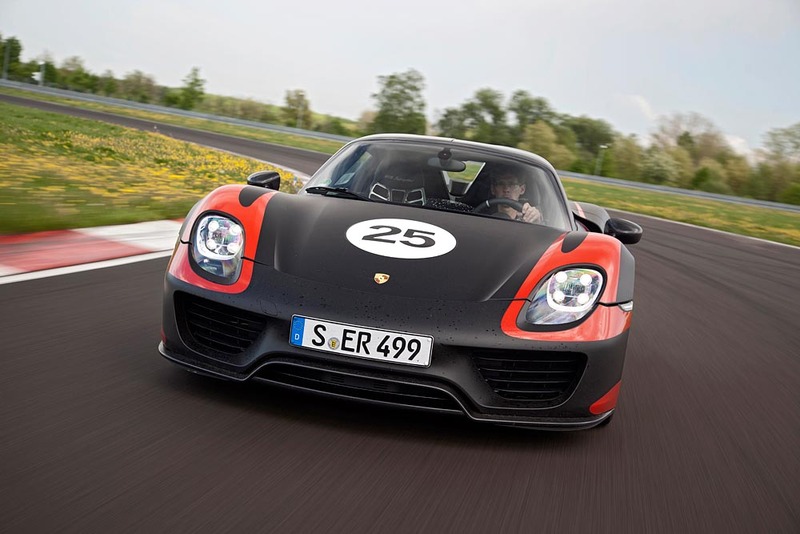 In short, the 918 Spyder will act as the gene pool for the Porsche sports cars of the future. A key message of the 918 Spyder is that the hybrid drive from Porsche is a plus for no-compromise driving dynamics. Drivers can experience this thanks to the unique all-wheel drive concept with a combination of combustion engine and electric motor on the rear axle and the second electric motor on the front axle. It is based on knowledge gained by Porsche during motor races with the successful 911 GT3 R Hybrid. Due to the additional, individually controllable front drive, new driving strategies for extremely high, safe cornering speeds can be implemented, especially for bends. Furthermore, the advanced “boost” strategy manages the energy of the electric drive so intelligently that, for every sprint with maximum acceleration, the full power of the 918 Spyder can be tapped into by simply pressing the accelerator down fully. In short, the 918 Spyder allows even drivers without motorsport training to experience the potential of advanced longitudinal and transverse dynamics. The 918 Spyder utilizes the best state-of-the-art technologies, taken straight from motor racing, to achieve its top performance. The entire load-bearing structure is made of carbon fibre reinforced polymer (CFRP) for extreme torsional rigidity. Additional crash elements at the front and rear absorb and reduce the energy of a collision. The car’s unladen weight of approximately 1,640 kg (“Weissach” package), an excellent low weight for a hybrid vehicle of this performance class, is largely attributable to this concept. The drivetrain components and all components weighing over 50 kg are located as low and as centrally as possible within the vehicle. This results in a slightly rear end biased axle load distribution of 57 per cent on the rear axle and 43 per cent on the front axle, combined with an extremely low centre of gravity at approximately the height of the wheel hubs, which is ideal for driving dynamics. The central and low position of the traction battery directly behind the driver not only supports efforts to concentrate masses and lower the centre of gravity; it also provides the best temperature conditions for optimum battery power capacity. Porsche Active Aerodynamic (PAA), a system of adjustable aerodynamic elements, ensures unique and variable aerodynamics; its layout is automatically varied over three modes ranging from optimal efficiency to maximum downforce and is tuned to the operating modes of the hybrid drive system. In “Race” mode, the retractable rear wing is set to a steep angle to generate high downforce at the rear axle. The spoiler positioned between the two wing supports near the trailing edge of the airflow also extends. In addition, two adjustable air flaps are opened in the underfloor in front of the front axle, and they direct a portion of the air into the diffuser channels of the underbody structure. This also produces a “ground effect” at the front axle. In “Sport” mode, the aerodynamic control system reduces the attack angle of the rear wing somewhat, which enables a higher top speed. The spoiler remains extended. The aerodynamic flaps in the underfloor area close, which also reduces aerodynamic drag and increases attainable vehicle speeds. In “E” mode, the control is configured entirely for low aerodynamic drag; the rear wing and spoiler are retracted and the underfloor flaps are closed. Adjustable air inlets under the main headlights round off the adaptive aerodynamic system. When the vehicle is stationary and in “Race” and “Sport” mode, they are opened for maximum cooling air intake. In “E-Power” and “Hybrid” modes, they close immediately after the car is driven off in order to keep aerodynamic drag to a minimum. They are not opened until the car reaches speeds of approximately 130 km/h or when cooling requirements are higher. The core of the 918 Spyder concept is its distribution of propulsive power among the three power units; their cooperation is controlled by an intelligent management system. 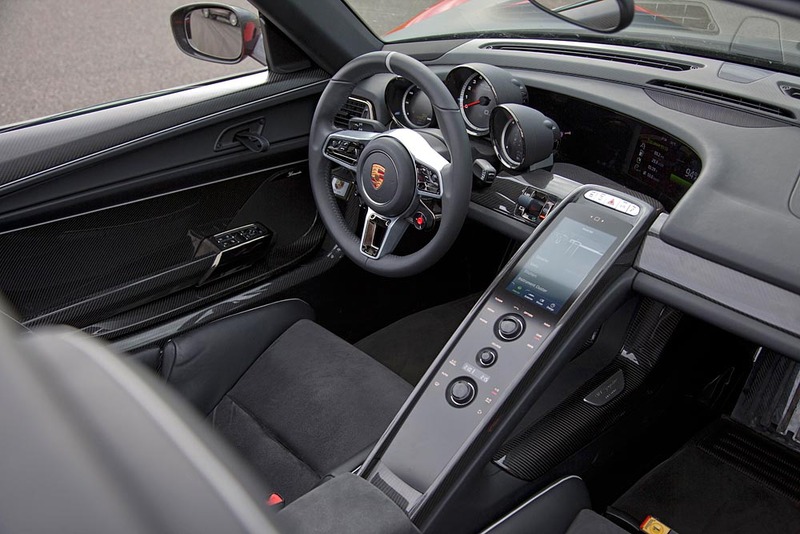 To best exploit these different approaches, the Porsche developers defined five operating modes that can be activated via a “map switch” on the steering wheel, just like in motorsport cars. On the basis of this pre-selection, the 918 Spyder applies the most suitable operating and boost strategy without driver intervention, thus allowing the driver to concentrate fully on the road. When the vehicle is started up, the “E-Power” mode is the default operating mode as long as the battery is sufficiently charged. In ideal conditions, the 918 Spyder can cover over 30 kilometres on purely electric power. Even in pure electric mode, the 918 Spyder accelerates from 0 to 100 km/h in less than seven seconds and can reach speeds of up to 150 km/h. In this mode, the combustion engine is only used when needed. If the battery’s charge state drops below a set minimum value, the vehicle automatically switches to hybrid mode. In “Hybrid” mode, the electric motors and combustion engine work alternately with a focus on maximum efficiency and minimum fuel consumption. The use of individual drive components is modified as a function of the current driving situation and the desired performance. The Hybrid mode is typically used for a fuel economy-oriented driving style. In more dynamic situations, the 918 Spyder selects the “Sport Hybrid” mode for its power sources. The combustion engine now operates continuously and provides the main propulsive force. In addition, the electric motors provide support in the form of electric boosting or when the operating point of the combustion engine can be optimised for greater efficiency. The focus of this mode is on performance and a sporty driving style at top speed. “Race Hybrid” is the mode for maximum performance and an especially sporty driving style. The combustion engine is chiefly used under high load, and charges the battery when the driver is not utilising its maximum output. Again, the electric motors provide additional support in the form of boosting. Furthermore, the gear-shifting programme of the PDK is set up for even sportier driving. The electric motors are used up to the maximum power output limit to deliver the best possible performance for the race track. In this mode, the battery charge state is not kept constant, rather it fluctuates over the entire charge range. In contrast to Sport Hybrid mode, the electric motors run at their maximum power output limit for a short time for better boosting. This increased output is balanced by the combustion engine charging the battery more intensively. Electric power is thus available even with several very fast laps. The “Hot Lap” button in the middle of the map switch releases the final reserves of the 918 Spyder and can only be activated in “Race Hybrid” mode. Similar to a qualification mode, this pushes the traction battery to its maximum power output limits for a few fast laps. This mode uses all of the available energy in the battery. A seven-speed Doppelkupplung (PDK) transmission handles power transmission to the rear axle. The high-performance transmission is the sportiest version of the successful PDK; it has undergone a complete redesign for the 918 Spyder and has been further optimised for high performance. To ensure a low mounting position for a low centre of gravity of the entire vehicle, the gear unit was turned “upside down” by rotating it 180 degrees about its longitudinal axis, in contrast to other Porsche series. If no power is required on the rear axle, the two motors can be decoupled by opening the decoupler and PDK clutches. This is the action behind the Porsche hybrid drive’s typical “coasting” with the combustion engine switched off. For very performance-oriented customers of the 918 Spyder, Porsche offers the “Weissach” package. These modified super sports cars can be recognised at first glance by special colours and designs that are based on legendary Porsche race cars. The roof, rear wings, rear-view mirrors and frames of the windscreen are made of visible carbon. Parts of the interior are upholstered with Alcantara instead of leather, and visible carbon replaces much of the aluminium. Sound insulation has been reduced. The emphasis on performance is not just visual: very lightweight magnesium wheels reduce unsprung masses; gross weight was reduced by about 35 kg. The benefits are experienced in further improved dynamic performance. Other references from motorsport are six-point seatbelts for driver and front passenger, optional film-coating instead of body paint, as well as additional aerodynamic body parts in visible carbon. 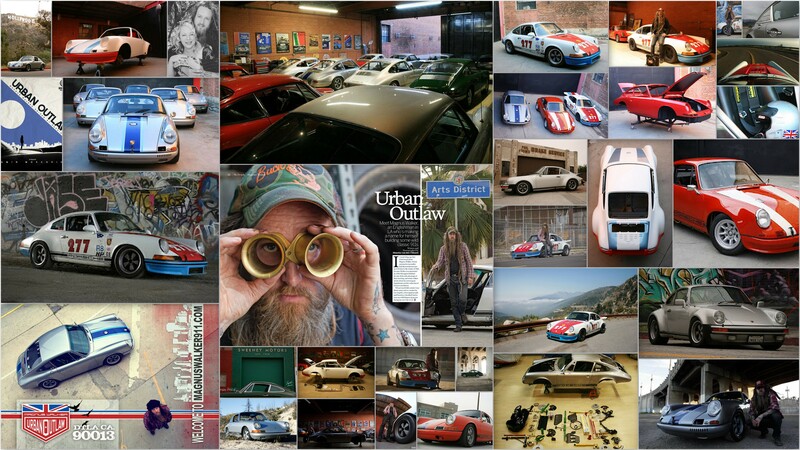 A portrait of Magnus Walker, the rebel Porsche customizer who turned a hobby into an obsession, and an obsession into a successful business. From a workshop in downtown Los Angeles, Magnus obsessively harvests fragments from donor 911s, grafting them onto vintage frames to create one-of kind automobiles with the spirit of Ferdinand Porsche but an ethos entirely his own. Hey… They even wrote back! Saying words to the affect “give us a call back when you are older”. Fast forward a few years, and in 1986 at the age of 19 I moved to America and started a new life in LOS ANGELES..
At the age of 25 in 1992 I acquired my first 911, now almost 20 years later and over 40 -911 cars later I am living my PORSCHE dream. I have done some club racing and instructing with the POC throughout the past 10 years. Over the past few years I have been expanding my 64-73 early car collection and have been building quite a few “sports purpose” R -ST inspired streetable track type cars. My builds are starting to gain world wide attention, and a few unique touches such as my grafted R turn signals, louvered deck lids, drilled door handles and attention to detail to name a few are becoming my “signature marks”. 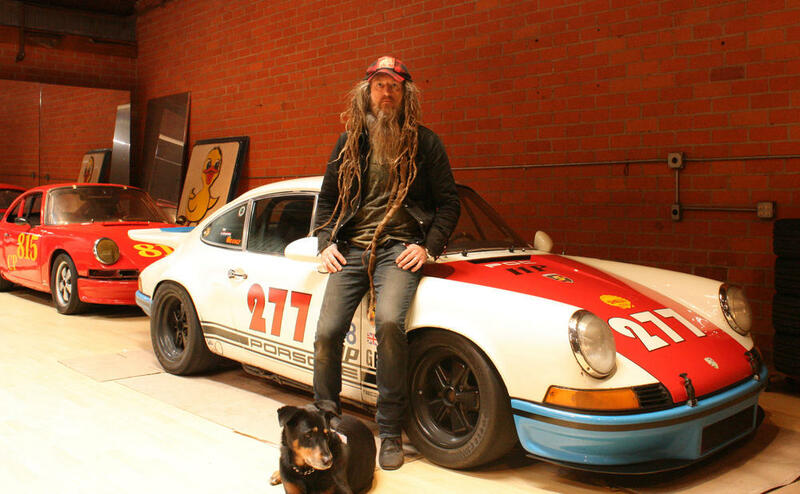 Magnus Walker poses with his 1971 Porsche 911. 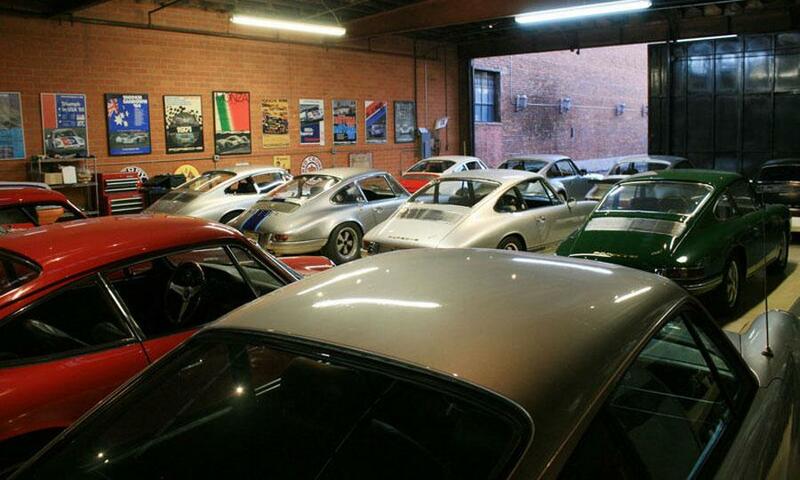 Photo by Magnus Walker. 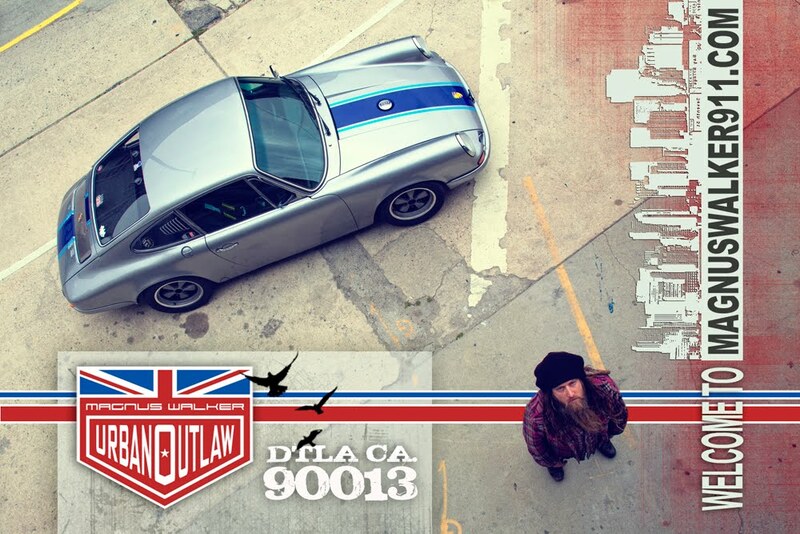 Magnus Walker The Outlaw. The Trailer. accepted into the RAINDANCE FILM FESTIVAL in London. will be distributed & released worldwide online via Reelhouse.org. Since the trailer was released in late May of 2012 it obtained over a 1.2 million click throughs. The initial intent was to submit the film to festivals. Since submitting the film to festivals and competitions the film has won a prestigious Award of Merit from the Best Shorts Competition, for short documentary. The film is schedule to debut in London at the Raindance Film Festival on Sept. 28 2012, and will play in Atlanta and Edmonton shortly there after. While the film continues to navigate the festival circuit, Tamir & Magnus have decided that limiting the viewership to select cities, with limited seating, would be the wrong choice for the film. . Following Raindance the film will be made available online. We’ve opted to go with Reelhouse.org, a new platform for film audiences. Knowing that we were going to release the film globally we wanted a platform that could create a theatrical experience that was intimate. Reelhouse is more then a micro site, or faceless link for audiences to view. Through Reelhouse.org viewers can reach out toMagnus Walker and to the filmmaker. In the spirit of Louis C.K., and the filmmakers behind Press Pause Play, this is a new age in filmmaking, let’s cut out the distributors, studios and marketers. Let good film connect with an audience, and let that audience connect with the filmmakers. If the audience likes the film, they can support the filmmakers. In short, let’s continue down the path of accessible art for the masses. The Porsche 918 Spyder is coming. Production of the most anticipated Porsche starts at the company’s Stuttgart plant on Sept. 18, 2013 with only 918 units to be produced. Porsche will start selling the car for a starting price tag of $845,000 and the first customer cars will begin arriving in the United States near the end of 2013. That’s quite a bit time. But before all that happens, Porsche decided to give a select few a first ride in a very early prototype for the 918 Spyder. 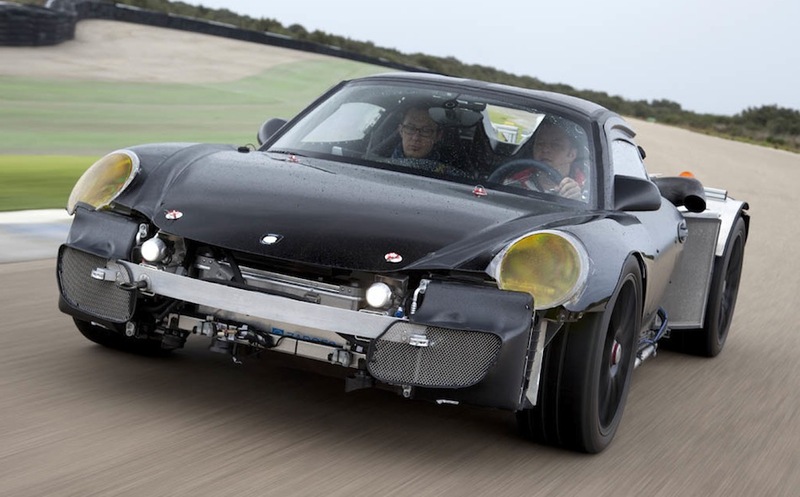 A ride in a 2014 Porsche 918 Spyder prototype, the only one in the world at a remote test track, a gaggle of Porsche engineers are at work, surrounded by all sorts of data-logging equipment. And there, in the middle of it all, is the 918. 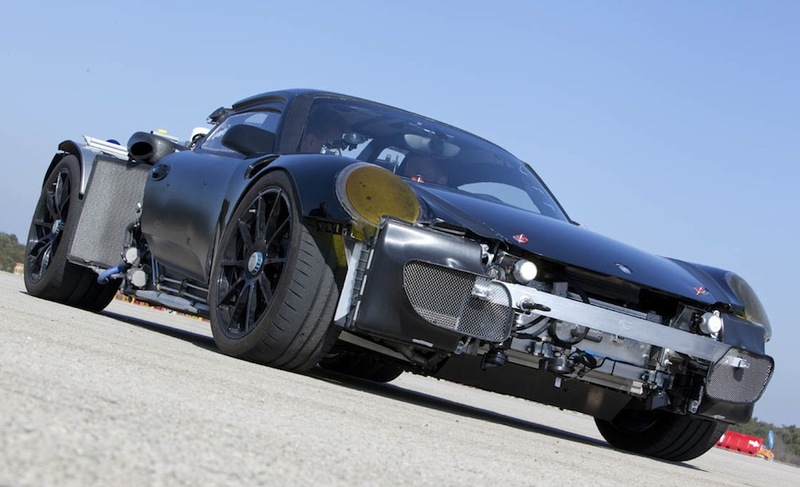 The first ever Porsche 918 Spyder to run under its own means is nothing more than a rolling chassis pieced together so engineers can test its gasoline-electric hybrid drivetrain. Partly covered in modified Porsche 911 body panels and flaunting outrageous exhaust pipes that sprout up from the engine bay at the rear (a feature we’re assured will be retained for production), it is a long way from the 918 Spyder concept that basked in the spotlight at the 2010 Geneva Auto Show. “The production version will be very similar to the concept car in overall appearance,” Frank Walliser, chief engineer for the 918 program. As we know the Porsche 918 Spyder by now. Mere months after its unveiling, Porsche confirmed it would put the supercar into production as a successor to the celebrated Carrera GT, starting on September 18, 2013. 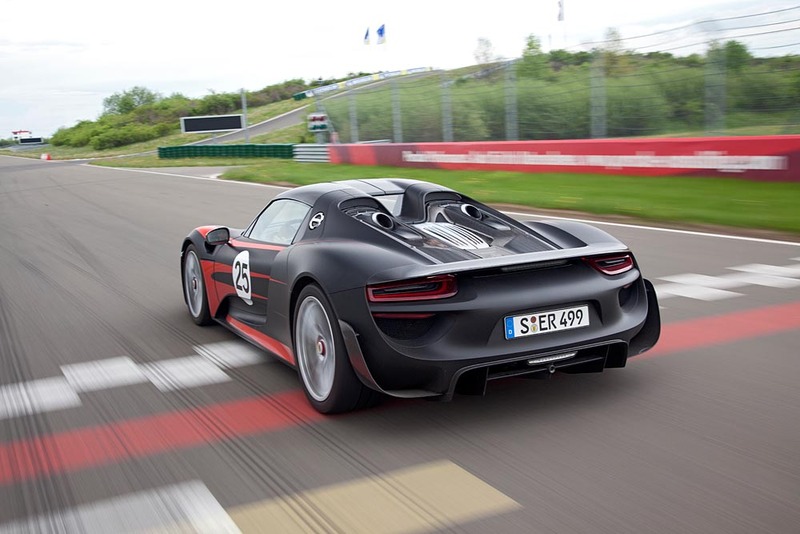 Just 918 examples are planned, each running down a dedicated line that is being established in a former paint shop at the car maker’s Zuffenhausen headquarters in Germany. 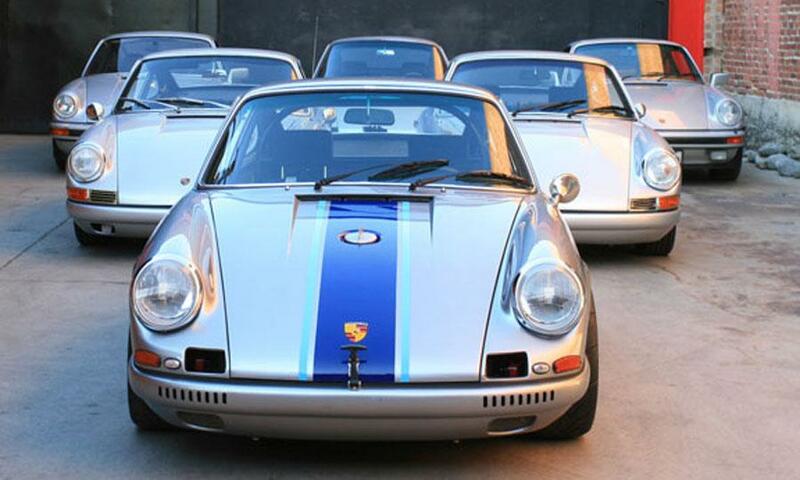 It is the same factory that builds the latest Boxster and 911 — a holy grail to true Porsche fans, no less. The Porsche engineers make some adjustments to the prototype’s electronics, which are housed in a makeshift aluminum box strapped to an area that will eventually be occupied by the production car’s rear spoiler. Walliser’s boss, Wolfgang Hatz, Porsche’s chief of research and development, slides down into the driver seat and twists a key in the left-hand-mounted ignition. Odd whirring sounds rise up from underneath before the gasoline engine catches and fills the garage with a deep pulsating blare of exhaust from those prominent tailpipes. The centerpiece of the new Porsche is its mid-rear-mounted V8 gasoline engine, seated on traditional rubber mounts (rather than the hydraulic mounts used on the 911) within a carbon-fiber cradle that is attached to the back of the main tub by six prominent mounting points. 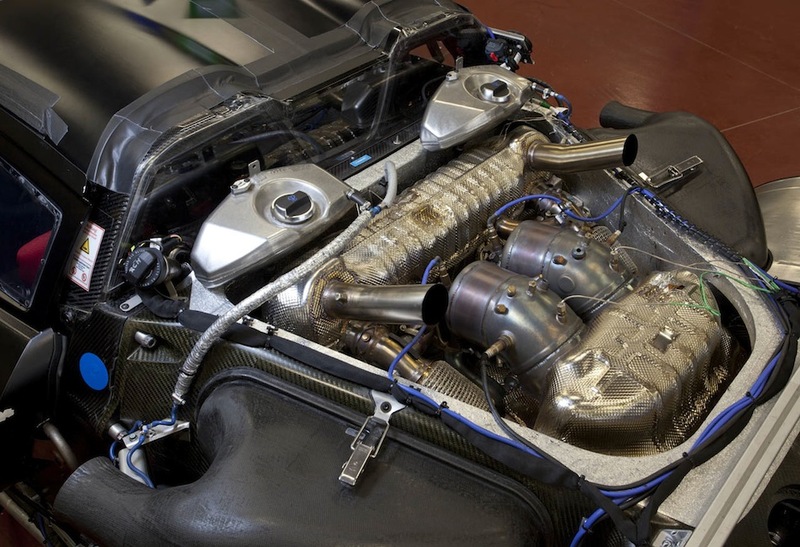 Similar to the 90-degree V8 used in the Porsche RS Spyder successfully campaigned in the American Le Mans series between 2005 and 2008, the engine has gained 1.2 liters of displacement, going from 3.4 liters in race trim up to 4.6 liters in this application. Walliser describes the engine as “entirely new,” noting that it features an all-new crankcase, cylinder head design and low-reciprocating-mass internals, plus that radical exhaust system that sees two pipes exit just behind the integral carbon-fiber roll hoops. The point of this arrangement is to keep hot exhaust gases well away from the car’s heat-sensitive battery pack mounted down low directly behind the tub. The revamped V8 has been tuned to rev to a dizzying 9,200 rpm (though in its current state of tune, it has a lower redline), and owing to its racing gene, Walliser promises it will deliver the same razor-sharp throttle response as the Carrera GT’s 5.7-liter V10. Porsche engineers tell us the V8 makes about 562 horsepower. 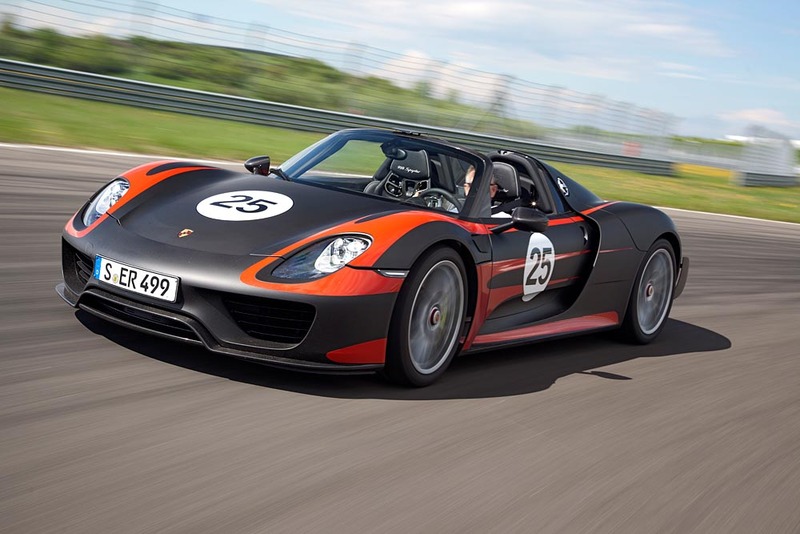 But the 2014 Porsche 918 Spyder is a hybrid, remember, so it also has a pair of synchronous electric motors — one mounted up front acting exclusively on the front wheels with 107 hp, and a second, 121-hp motor attached to the rear of the gasoline engine providing drive to the rear wheels. We’re told total system power will be in the neighborhood of 759 hp, with 568 pound-feet of torque. Barely containing his delight at finally getting to show off the 918 Spyder to someone other than an engineer, Hatz gingerly guides the prototype out of the garage. After prodding the throttle a couple times to release some heat into the engine and its peripheries, he speeds off into the distance. We scramble back into the Multivan and catch up with the prototype at the end of an immense test track. The engineering team has spent the 10 days here at the track methodically running through the first systems test of the new car. This car will offer five driving modes. There’s “e power” for all-electric operation, a “hybrid” mode that allows either electric or gasoline operation, followed by “sport hybrid,” which is the first of three performance-oriented gasoline-electric modes. Beyond that, “race hybrid” calls up even further levels of performance, while “hot lap” unleashes all the battery’s remaining power for short periods of what Walliser describes as overboost. 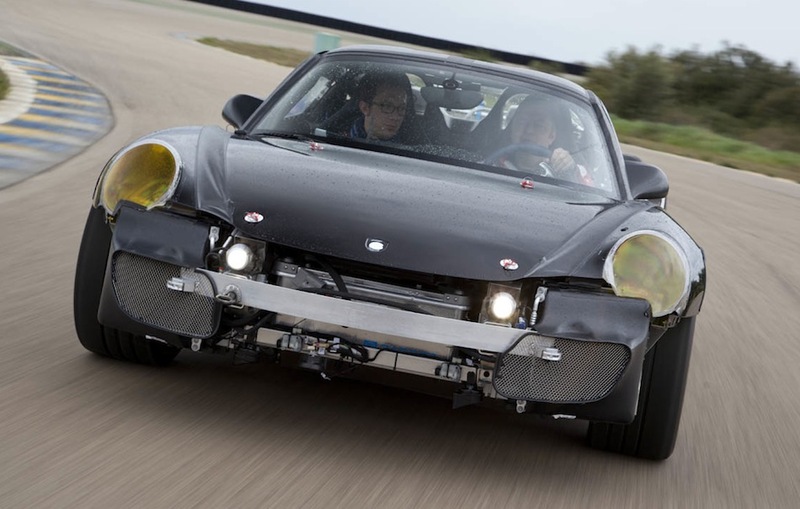 Nothing is official just yet, but Porsche is aiming for a curb weight around 1,700 kg (3,747 pounds), with 0-62-mph acceleration in less than 3 seconds. 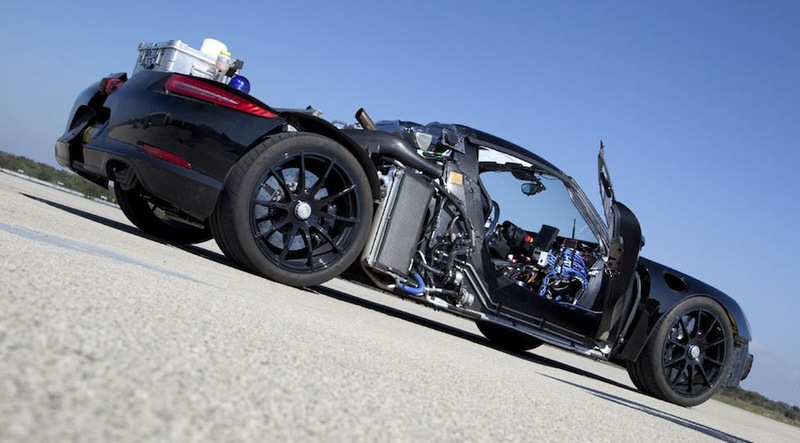 The 2014 Porsche 918 Spyder prototype rides on a unique chassis made almost entirely from cast-aluminum components. The suspension is a combination of double wishbones at the front and a multilink setup in back, but unlike the system on the Carrera GT, which used a racecarlike pushrod system attached to the unit-body, the 918 has conventional springs and dampers sited outboard near the center-lock-style wheels, which measure 20 inches up front and 21 inches in the rear and are wrapped in 265/35R20 and 325/35R21 Michelin Pilot Sport Cup rubber. Computer simulations suggest the production car will be capable of generating up to a 1.4g on the skid pad (though that’s a maximum figure, rather than the average lateral acceleration we customarily report). He also drops a Nurburgring claim: Porsche is targeting 7 minutes, 22 seconds on the Nordschleife — still well short of the Dodge Viper’s 7:12, but moving nonetheless. Even in early prototype form, the 2014 Porsche 918 Spyder is hugely impressive. There’s still a long way to go — another 18 months of intensive development, no less. But as our ride comes to an end, we’re struck by just how far Porsche’s engineering team has come during just 10 days of development work on the rolling chassis. evo’s Editorial Director and Founder Harry Metcalfe has a look at the future of the supercar. From Top Gear: The performance headlines are this. Acceleration from 0-62mph in ‘less than three’ seconds. Zero to 125mph in a time that almost matches a Bugatti Veyron. And a Nürburgring lap time (so far verified only on Porsche’s supernaturally accurate simulators), of 7.22. That’s 10 seconds faster than the old Carrera GT, and 10 seconds. From AutoWeek: As if that’s not enough, Porsche also says its new supercar will boast a combined city/highway fuel-consumption figure of more than 78.4 mpg (U.S.) on the current European cycle. By comparison, the Carrera GT returned just 13.2 mpg (U.S.) under the same test procedure. From Wired: Porsche pulled a variant of the 4.6-liter V8 originally fitted to the three-time ALMS LMP2 Championship-winning RS Spyder. 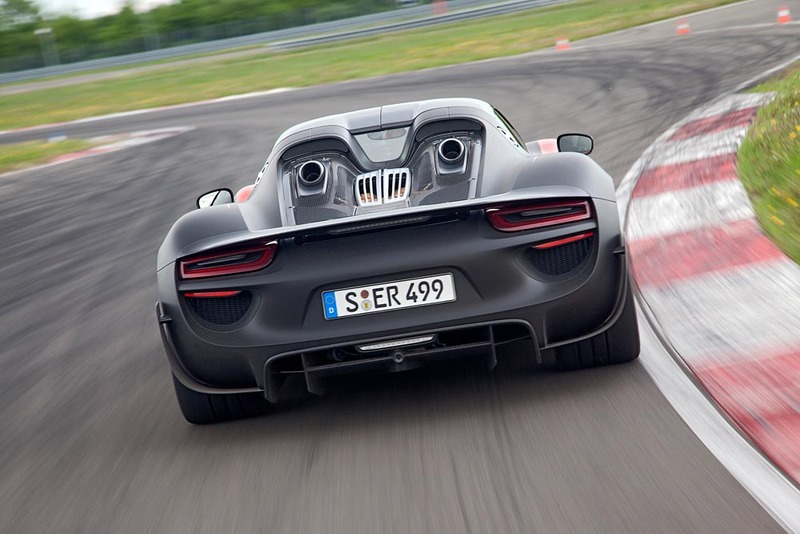 That engine put out a comparatively paltry 503 horsepower, but fitted to the 918, output is up to 570 hp. That figure is before you account for the 918′s two electric motors, and it’s also where the similarities to past supercars ends.